Indian captain Mahendra Singh Dhoni reckons that the dressing room atmosphere of this current Indian team has been "the best" during his five years in international cricket. "It's the best dressing room atmosphere, I have felt in the last five years that I have played international cricket. Most of the guys have achieved a lot in their Test careers. So they are enjoying their cricket and it feels a very complete dressing room now," Dhoni said on the eve of the crucial third Test against South Africa. "We have youngsters who are a part of the side where they are being groomed under experienced senior cricketers. So it is a very happy dressing room. Lot of credit goes to the members of the squad, support staff," Dhoni added. 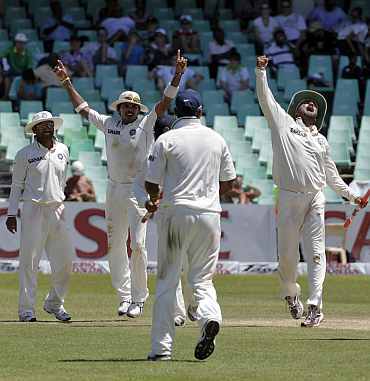 Dhoni thinks that playing at Newlands gave India the best chance of accomplishing a historic series win. "The fact is we have the best chance to win the series. If you see, the last time also in 2006 we had won one and lost one, we came to Cape Town with the series levelled. It's a fair chance, both teams will like to win, but team playing consistent cricket will lift the trophy," he said. Dhoni is fully aware that this is the best opportunity for the Indian team to create history. "Well, it's a chance to create history, as was the last time when we won out first Test in Johannesburg, that was the first ever Test we won in South Africa which is part of history. "Ditto in Durban, that means we have the talent and the temperament to be successful in South Africa, but as I always say, it's not about the past, not about the last game, all about those five days," he said. "In South Africa game changes quickly. Like in India, we say game changes in the fourth or fifth day, but here game can change any time. You can lose four-five wickets in any session, similarly two set batsmen can score really fast, we have seen scores of over 400 in a day," he added. Dhoni stressed that momentum will be crucial but more important is about having a good start. 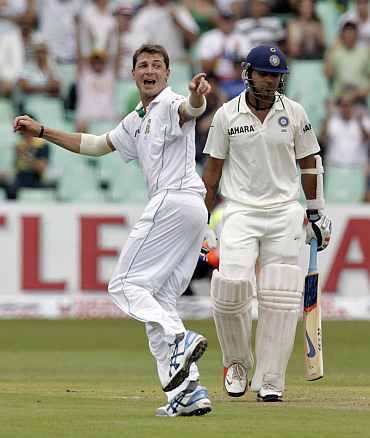 "Momentum is very important but I have always believed that the start in a Test match is very crucial. Of course, momentum is a big part but if it was such a big part you won't see sides losing matches after winning one. "South Africa also can take it as added responsibility rather than pressure. Of course they will feel it a bit because we are the touring side and we were 1-0 down, than we came back in Durban, it will be crucial how they look upon on this game. For us, we won't be playing any Test cricket for a long time. So let's hope for the best," Dhoni said. However, the skipper was quick to dismiss the pressure factor, saying that Indians are used to playing under tremendous pressure. "Indian team never play without pressure, good thing about this side is that we consider pressure as an added responsibility. 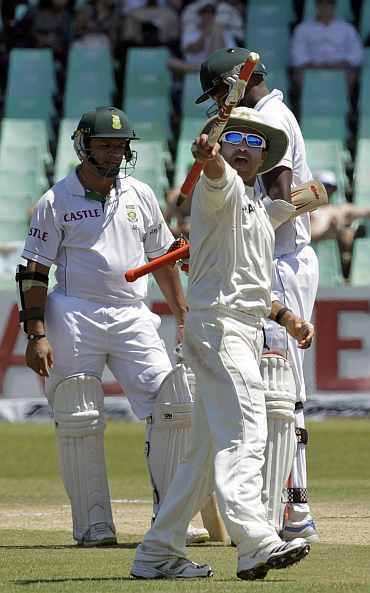 Winning in South Africa will be big for us, but we all know the reason why we can win a Test series here," he said. On whether toss will be a factor, Dhoni said, "Well, lot depends on what kind of wicket it is. If their is moisture, toss will be crucial, there will be that extra opportunity to get the opposition out. If you don't believe in toss, you don't believe in anything coming under it. It will be good if we win the toss, have those couple of good hours for the bowlers to get them out." When questioned whether the success that the Indian team is enjoying currently is because of the fantastic chemistry that he and coach Gary Kirsten share, he replied, "Me and Gary think likewise, as most of the members of the side. We always stress on the theory that full effort is full victory. "There are times when you could be beaten by the opposition even after giving 100 per cent. You take it with a big heart, knowing that you gave your 100 per cent," he added. 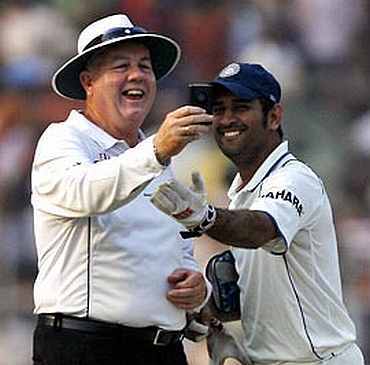 Although his opposite number Graeme Smith has been vocal about introduction of UDRS, Dhoni maintained his stance that he is still not convinced that the system is an error free one. "Umpiring errors are always part and parcel of cricket. Two gentlemen standing there will commit mistakes, it has happened to us. It has happened to others, if human beings don't make mistake, there will be no batmen who will get out, and there won't be a bowler going for boundary. "Until you come up with something that ensures that there won't be any bad decisions, we are not in favour," he added.